I would love the gift card!!!!!!!!!!!!! My son would love this card! Thanks for the chance. My students would love these tatoos. My 9 yr old grandaughter would love to take this card from me, just for the bugs. love Target and all your help in saving money!!! maybe today is my day to win!! Thanks for the awesome info. and giveaways! Awesome card. I would love to win this. Awesome I would love to win this one. Hope I can win one this time! a comment on this post! I already do like TT on FB! 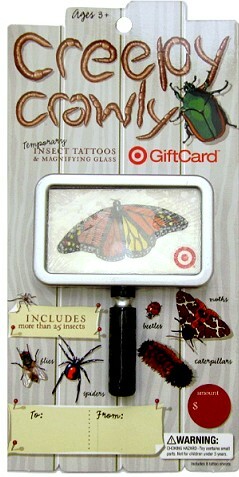 My boys love bugs so they would love this giftcard! Cute card! My boys would love this one! Thank you for the chance to win it! I like totally target on Facebook. Thank you for this chance to win! I would love to win!!! I totally love Target! Would love to win. I love Target.